In Seattle during WWII, fake trees, fake buildings, and fake neighborhoods were created by Hollywood set designers to camouflage wartime manufacturing from foreign adversaries. Our show at Oxbow takes as its starting point the faithful recreation of a few of the fake trees, removed from their original context. Our re-creation of these trees at Oxbow is meant to be seen from underneath, rather than above, where the materials we used can be most easily distinguished from the overall form intended. 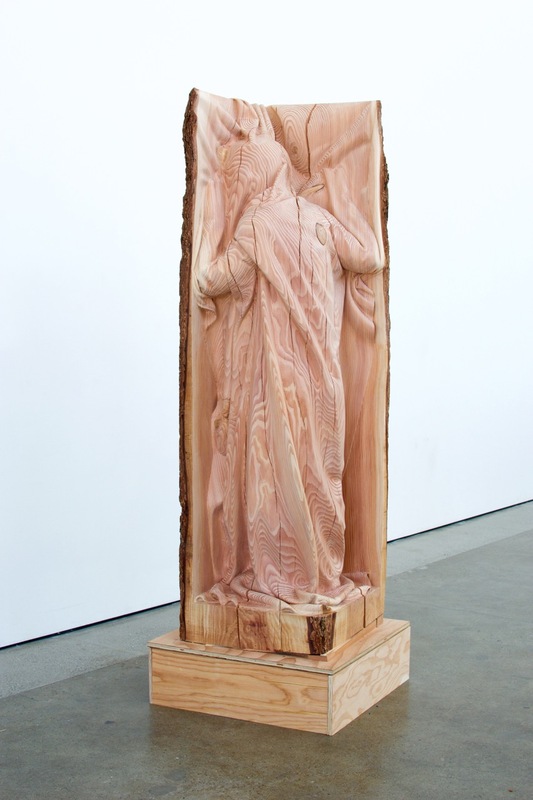 From up close, any real attempt at the illusion of a tree falls apart and what the viewer experiences instead are rough and provisional materials clinging to some recycled timbers– the sole representatives of a forest. But our representation of a historical moment still maintains its resolution, whatever that might be. It sits in the same general neighborhood as the original and it is clearly cobbled together with the same materials the set designers used– feathers, chicken-wire, green flocking, burlap, and salvaged timbers. That these are somehow an appropriate set of materials for an historical recreation is conveniently ironic as they also seem to evoke the provisional methods available to us for depicting and agreeing upon the nature of historical events in general. Recognizing the change in context, and in viewpoint, of this historical re-creation is important: how does a person experience something that is designed to be understood in one context and from one perspective, in a different context and from a different perspective? By positioning the viewer below the trees rather than above the trees, inside rather than outside, we hope to reveal something completely different and unintended, despite the fact that the objects themselves remain faithful to their historical roots. Photographs make clear that from thousands of feet in the air these rough and provisional structures were virtually indistinguishable from real trees. From an aerial perspective alone, generally considered the most objective viewpoint, accuracy can be challenging to verify. When a singular perspective of any context is built into our experience of something– be it history, politics, social media or anything else –space for deception is created. Standing here underneath this object, the strange world that constantly demands interpretation remains, but we are momentarily free of deception, ushered in as participants in the construction of meaning and context rather than held at bay as audience members. GENERATIONS is a series of simulations taking form, falling apart, and crisscrossing terrains. Each site-specific iteration is both a standalone piece of social software and integrated component of a hermetic yet ubiquitous network moving from realistic reflections to perversions of truth, orders of sorcery to dissolutions so inherently synthetic that their implied symbolism collapses into digital dust. Nothing is fixed. Dylan Neuwirth (b. 1977, Athens, Georgia) is a contemporary artist working with light, space, and interactive technologies. He has participated in numerous solo, group, and public art exhibitions including curatorial and web-based projects. His work is in private and institutional collections, and has appeared in Creators, Brooklyn Magazine, Artslant, Artsy, New American Paintings, artnet, The Huffington Post, The Wall Street Journal, Beautiful/Decay, WIRED, and VICE. From 2007-2016, he executed large-scale architectural glass commissions across North America, the United Kingdom, Europe, the Middle East, and Asia as a Project Manager with Chihuly Studio. He is currently the Creative Director at Western Neon, Executive Director at Western Neon School of Art, represented by SEASON, and lives in Seattle, Washington. Dylan is represented by SEASON. 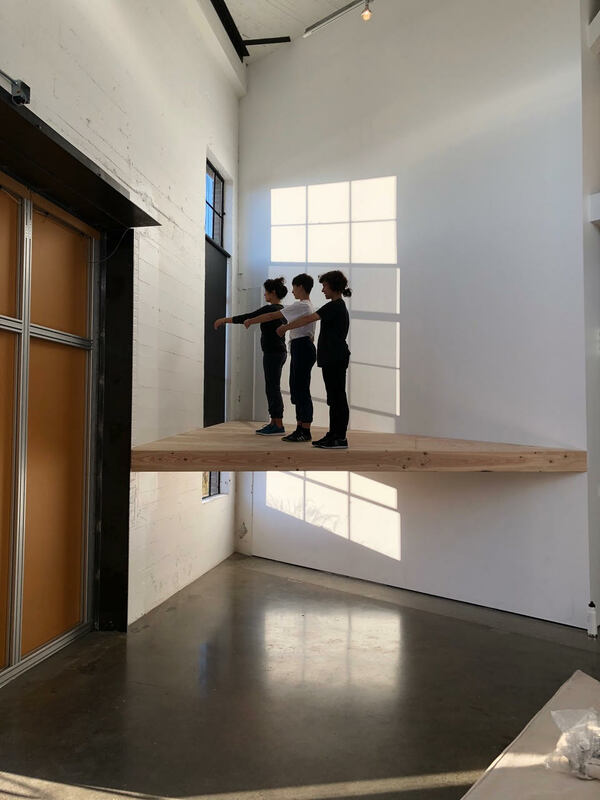 Klara Glosova returns with her latest site-specific installation at Oxbow's artist-in-residence space. Don't miss the opening reception on Saturday, June 9th in Georgetown. The reception is concurrent with the annual Georgetown Carnival (starting at 12 noon). Detail from "Delirious Dreaming Pugilist and Other Stories"
"The cornerstone of this project is a small print of a brick wrapped in brown butcher paper and named “Pugilist”. In fact, picture two bricks. The two main characters—the stars of the show—are a pair of bricks, one for each hand. They are not particularly stunning, monumental or impressive in their presence, nevertheless their weight is considerable - they can be used as a support or to hold things down, to break through or to build with. With these qualities in mind I want to build a new narrative for what it means to be a woman fighter." Klara Glosova is a Czech-born visual artist currently based in Seattle. She is a multidisciplinary artist working primarily in drawing and painting. Her work intertwines her personal history of political activism in Eastern Europe with her experience as an artist and mother and (above all) a curiosity and playfulness that extends to both concept and materials. Klara is also a founder of NEPO House and is always interested to see what happens when you place the inside out, invite the outside in and generally do things backwards. She received Seattle Magazine's Spotlight Award in 2013, Seattle Art Museum's Kayla Skinner Special Recognition Award, the New Foundation Fellowship and nomination for James W. Ray Distinguished Artist Award in 2014. In 2015 she was nominated for The Stranger Genius Award and a Betty Bowen Award finalist in 2017. This project was supported in part by a grant from 4Culture. Klara is represented by the Linda Hodges Gallery. 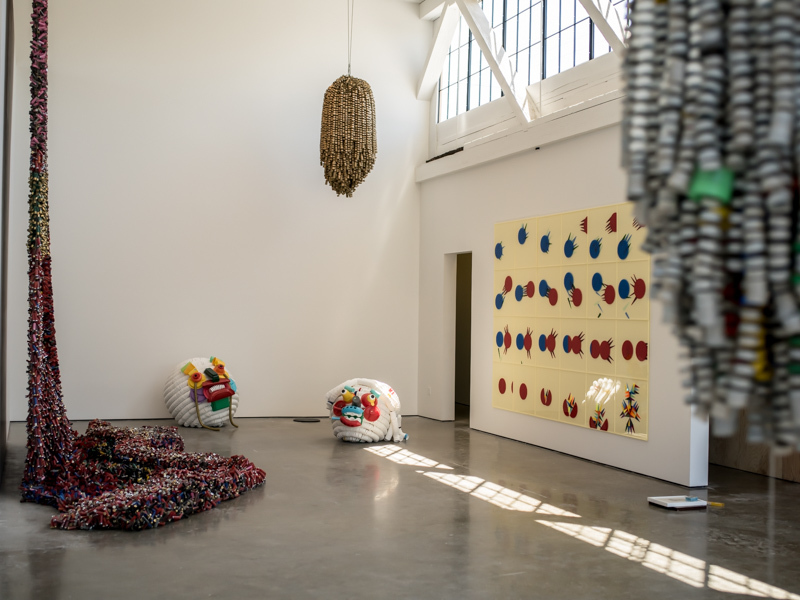 Employing an array of materials including plastic film, paper, sequins, and ribbon, Katy Stone responds to the movement of light and shadow within Oxbow gallery to create an installation that captures and magnifies light's presence. 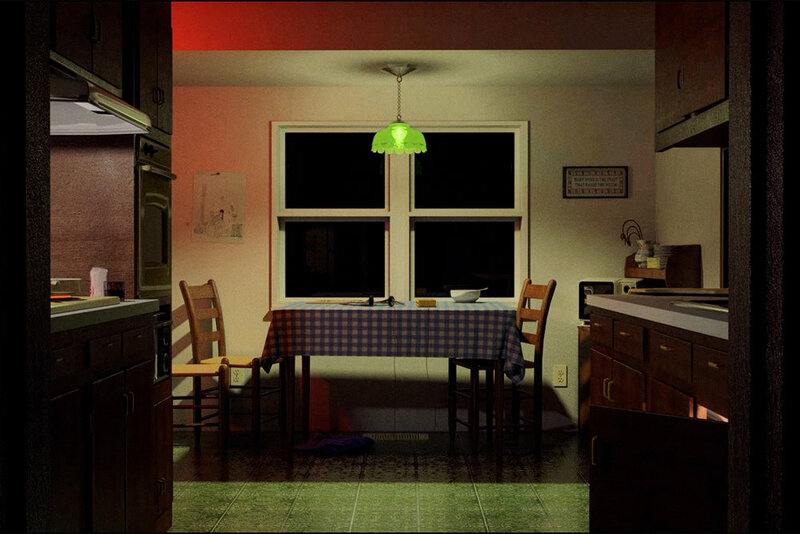 At a time of seasonal shift, More Light explores amassment and light as fact and metaphor. 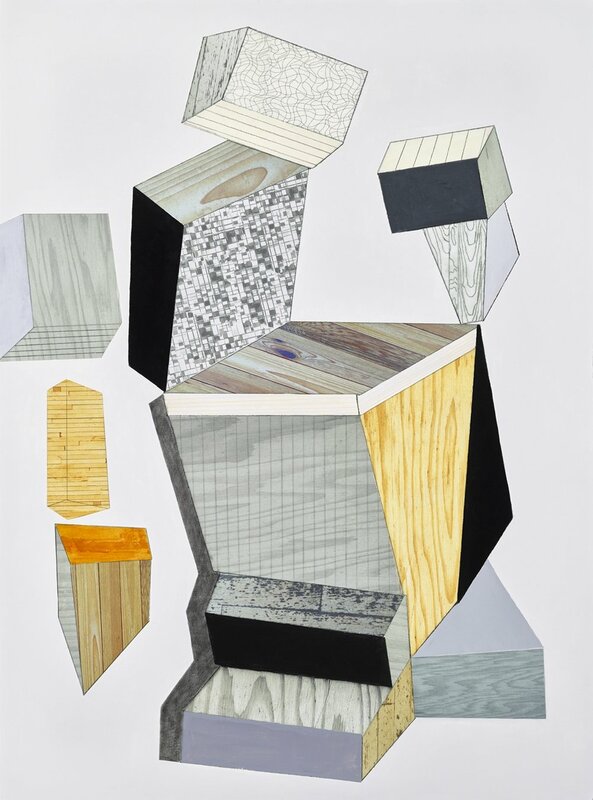 Katy Stone's work merges aspects of drawing, painting and sculpture, and is rooted in site specific, temporary installation. She uses a variety of industrial, synthetic materials to create complexly layered, architecturally-scaled assemblages that evoke natural phenomena and explore states of transformation. Stone received her BFA from Iowa State University and her MFA from the University of Washington. She has exhibited widely, including at Suyama Space; Boise Art Museum; Jacksonville Museum of Contemporary Art; McNay Museum of Art; Missoula Art Museum; University of Richmond; and at The Whatcom Museum. Her work is held in numerous collections including Boise Art Museum, City of Seattle, Columbia University, Iowa State University, Microsoft, and the McNay Museum of Art. Stone has completed major commissions for the GSA Art in Architecture Program at the Jackson Federal Courthouse, Jackson, MS; Ross School of Business, University of Michigan; Swedish Medical Center, Seattle; and Woodmont Library, Des Moines, among others. 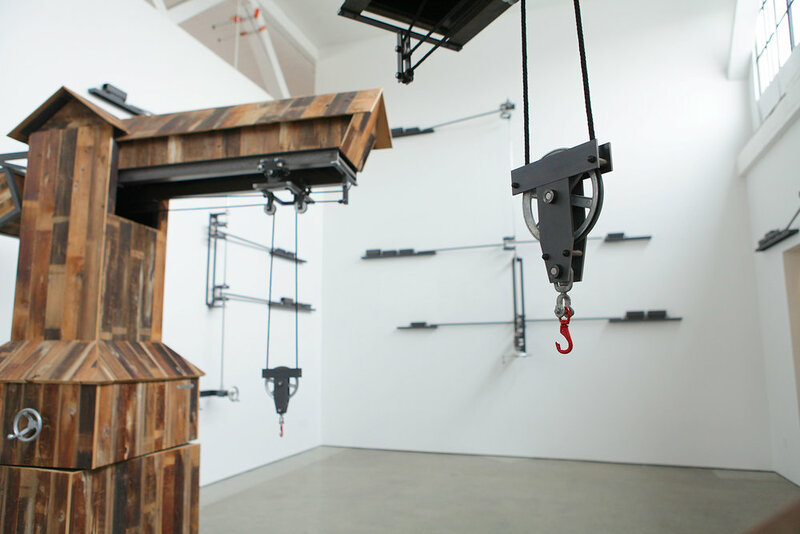 She is represented by Ryan Lee Gallery, New York, Robischon Gallery, Denver, and Johansson Projects, Oakland. She lives and works in Seattle. METANOIA is an immersive, autobiographical artwork created by Dylan Neuwirth and a team of collaborators. The Opening Reception is Saturday, February 3, from 6:00–9:00pm, with a Performance from 8:00–9:00pm. METANOIA: screenshot from a virtual reality experience for Oculus Rift supported by Unity — dimensions variable, © 2016-2018 Grant Kirkpatrick, Fritz Rodriguez, and Dylan Neuwirth. "METANOIA is an autobiographical body of work created from 2016-2018 with my mother, sister, and a team of dedicated collaborators. This collection of media began as a 27,000+ word artist statement in 2016 that mined my family's past, our shared addictions, and what it means to make art in a world gone insane. Through many diversions, it eventually morphed into a sculptural installation, performance piece, and virtual reality memoir. Staged in a self-help meeting, this is the presentation of my story on the day I turn 41 and 7 years sober. These are the events that led me to be me, this current version of myself. These are the experiences that propelled me out of the black hole of alcoholism into cycles of searching, belief, and transcendence while knowing these vital concepts are impossible to define. The exhibition centers around a box-set containing a neon sign depicting my mom's name, a blown glass Makers Mark bottle produced from memory with Jason Christian, one transparent red mix-tape, a graphic novel made in collaboration with Cold Cube Press, and a Japanese edition of Blade Runner in a VHS format. From a metal folding chair placed within environmental set pieces, I will perform an impromptu monologue about the past, present, and future while engaging for the first time with a virtual reality re-creation of my childhood kitchen generated by Grant Kirkpatrick and Fritz Rodriguez. With this body of work: I want to tell a story, banish a kind of lingering evil, reveal aspects of myself as naked as I can, and create a place where others might see things as they possibly never have before. While this cathartic process could be fulfilling, it indeed could be a disaster, maybe a failure full of possibilities—the place I think real creativity stems from, exploding in all directions with unknown and transformative powers." 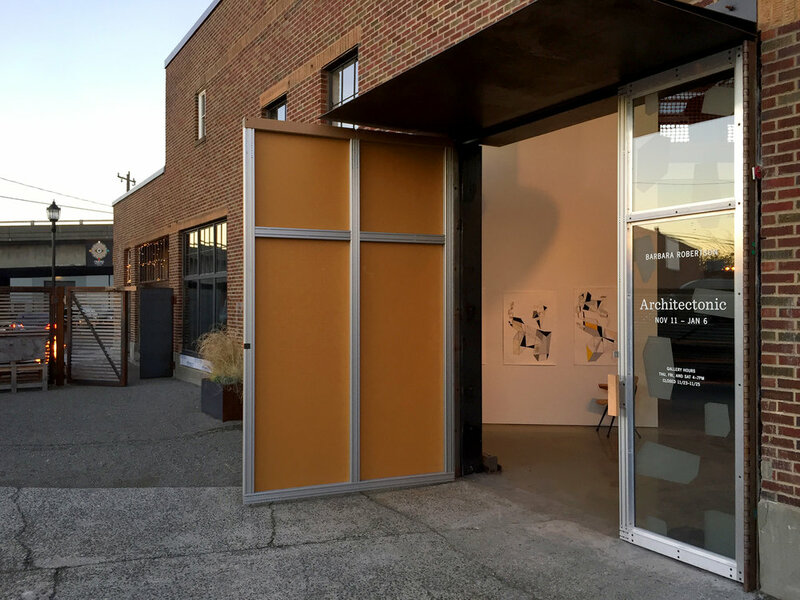 Witness Architectonic, Barbara Robertson's new site-specific art installation at Oxbow. 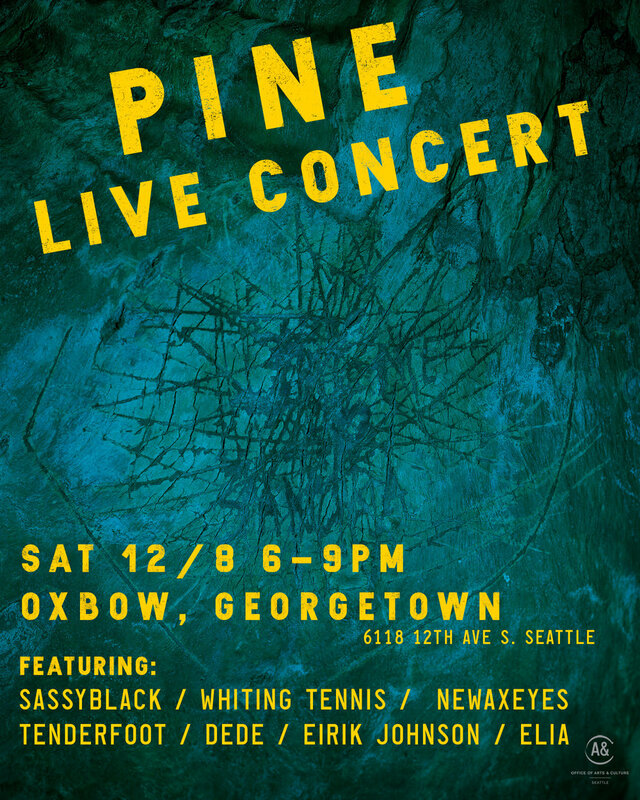 It debuts Saturday, November 11, in association with Georgetown Art Attack. 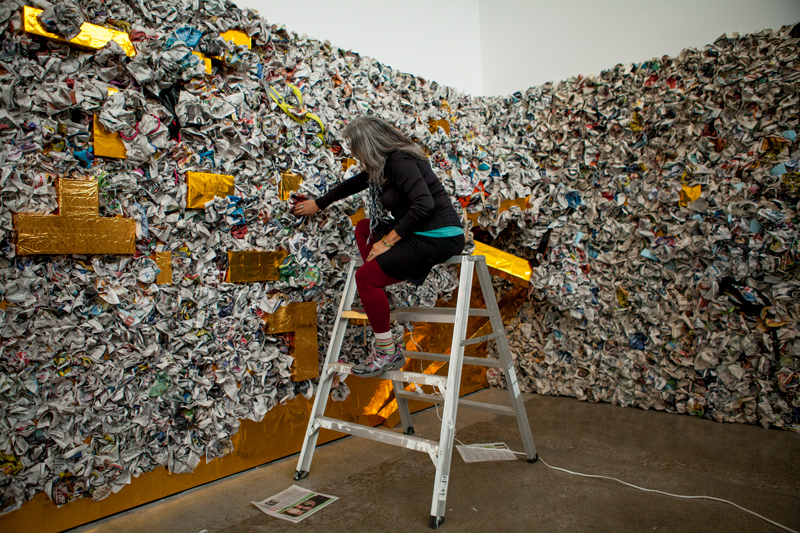 Barbara Robertson fuses current events with art history, exploring the topic of Seattle's rapid expansion through the lens of Constructivism, a WWI-era art philosophy. Architectonic consists of three projected animations and an original sound score by Johanna Melamed, enveloping the viewer in the work. This project is ongoing, and will continue to expand through the end of its exhibition. Join artist Dan Webb as he presents "The Visitor"—opening Thursday, June 29 from 6pm–9pm at Oxbow. This exhibition is the latest in a series of artist residencies featuring site-specific installations. The Visitor (Carved Face), Dan Webb, 2016. “I’m not an artist because of all the contemporary art I saw as a kid—I was inspired by a lot of other things that didn’t bother to call themselves art at all. And while I’m not even sure what art is exactly, it seems unlikely that it only exists in certain rooms, in certain buildings, in certain cities. It’s everywhere, if you look hard enough. That means art is free of a permanent address. At best it’s just a visitor, showing up in surprising places at surprising times. What I’m trying to do is just extend an invitation. My show ‘The Visitor’ will really only have one sculpture in it. The other objects are a set of chairs, a table with cups, bowls and plates, and a carved sign out front. The relative lack of objects makes for less of a gallery experience, and more of a living room experience. 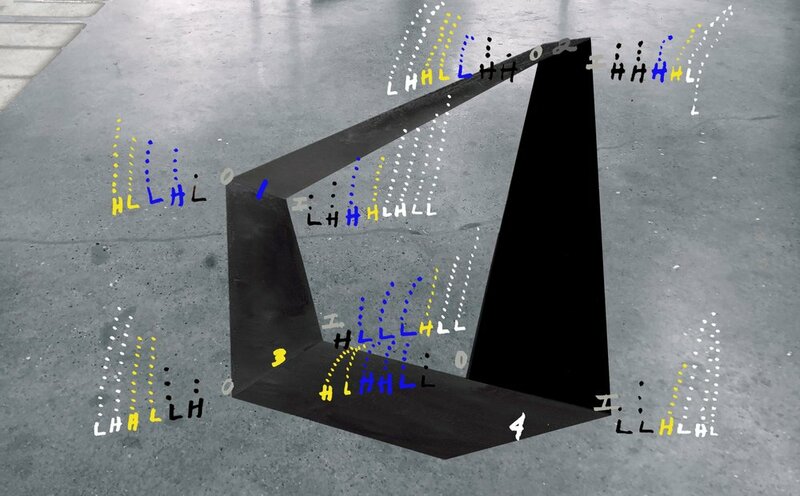 Everything in the show is usable – have a drink, sit down in the chairs, touch the sculpture. Talk to me if you want, because I’ll keep regular hours during the run of the show. In addition, on a semi-regular basis, I will give a lecture/introduction about what I mean by calling the show ‘The Visitor.’ The lecture is not a traditional artist lecture, where the work is described and explicated. It’s more of an invitation to participate in what the show is about: inclusion, conversation, relationships." The Visitor (Smooth Face Out), Dan Webb, 2016. The mural was designed and executed by Belle & Wissell Art Director Eric Harvey and Designer Izzi Vasquez. The Sugar Project explores the countless expressions and experiences of women’s commodification in contemporary culture. Artist Michelle de la Vega employs sugar throughout her work as a metaphor for society’s expectations and ultimate consumption of women—to be sweet, pleasant, and deferential above all else. Michelle’s method deeply integrates community into the generative processes and exhibitions of her cross-disciplinary installations. Her work includes sculpture, environmental design, video, collage, photography, choreography, text, and partnership-building through project based community engagement. SHAKE opens Saturday, June 13, 2015 at 12pm at Oxbow. Artist's Reception and Oxbow Preview, 5-8pm. BEMA is a design/build company focusing on exhibit and art fabrication, custom furniture design and fabrication, and building restoration projects.